The U.S. Geological Survey’s programmers have made a nifty nationwide map server called MapView that lets you play with geologic maps from most of the country. Naturally I zoomed in on Oakland. I expected to see something like this when I looked at the Toler Heights area. It’s crisp, it’s suitable for colorblind readers, but it’s wildly different. It shows simpler divisions and more limited areas of bedrock. 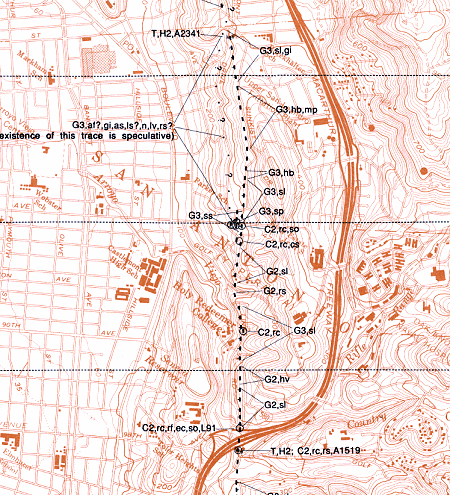 It shows the active trace of the Hayward fault running on the opposite side of the hill from where it actually moves. Then there are things I notice: the names of the rock units have an antique feel and very few faults are mapped. 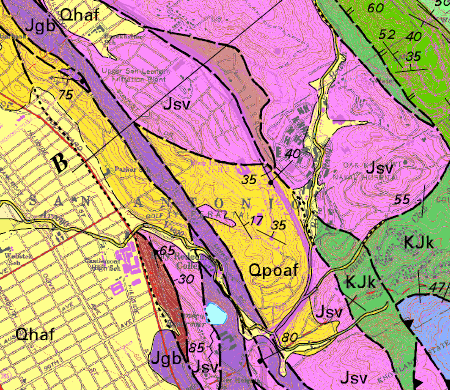 And what’s with the ludicrously small landslide (“Qls”) and serpentinite pod (“sp”) in the middle? Why such a mixture of vagueness and precision? In fact, this is not a USGS map at all, but a map issued by the Dibblee Foundation. Dibblee is the late and distinguished Tom Dibblee (1911–2004), popularly considered “the greatest geologic mapper who ever lived.” I consider him one of the greatest reconnaissance geologic mappers ever because that was his M.O. : to take his Jeep out to various high spots in poorly mapped territory and sketch out the bedrocks in the landscape onto a map base, then do field-checking until it was ready to publish. His skills were more than just fieldwork; he knew the literature and the community too, both scientific and industrial. I don’t have the talent to question his talent. But. If you download the map and look at its sources, you’ll see that it’s based on Dibblee’s fieldwork in 1963 and a short return visit in 1977, plus three “preliminary maps” issued by the USGS, one of them in 1967 and all of them superseded by the map I use, Russ Graymer’s USGS Map MF-2342 published in 2000. I can only infer that this map was based on Dibblee’s old field notes as edited, posthumously, by John Minch in his role as official map editor for the Dibblee Foundation. I don’t question his talent, either, but it would be a major undertaking to update this map, one that has not been done. What’s a few years, you might ask; the rocks never change. Well, consider that this map misplaces the Hayward fault. How do I know? It ignores the experience of Jim Lienkaemper’s meticulous mapping, which checks out in the field wherever I’ve looked. This is from his 1992 compilation of the fault trace and the supporting evidence. The Dibblee Foundation map is beautiful, but in this respect it is simply wrong. It didn’t go through the rigorous USGS review process; in fact I am confident that if it were submitted it would be rejected. I’m going to ask the MapView people to reconsider using these maps in preference to USGS maps. For now I have to say that MapView is not curated to my standards. UPDATE: The MapView administrator responded to me promptly and politely; I’ll excerpt his reply: “the point you raise has been a real concern . . . but [we] didn’t know the entire story nor had we been presented with a clear example of the problem, as you did in your blog. . . Our starting assumption is that newer maps supersede older mapping, and so unless there’s a compelling reason to not do so, we show the newer map. . . . The most effective way to improve upon what’s shown in MapView is for local and regional experts to weigh in with their opinion and experience, as you have done. I sincerely thank you for contacting us, and assure you that we’ll remove the Dibblee Foundation maps in all cases where there isn’t an older map of that scale that is ‘better’.” Translation: We pick maps by their release date and we won’t adjust that until someone squawks. The other attractive feature of the Dibblee maps is that they’re standard 7.5-minute quadrangles, which makes things much easier for the MapView programmers. But ease of programming is not the same as usefulness. This entry was posted on 11 March 2013 at 4:39 pm and is filed under Other topics, The Hayward fault. You can follow any responses to this entry through the RSS 2.0 feed. You can skip to the end and leave a response. Pinging is currently not allowed. 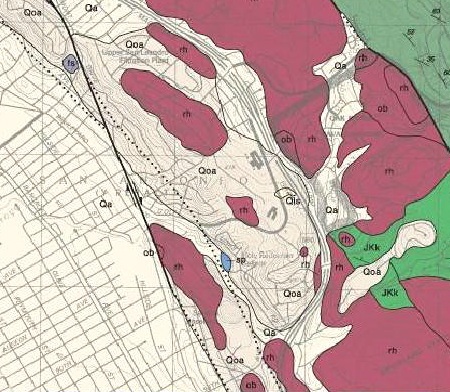 I once did an AP investigation on a site along the Hayward fault in Oakland; (as a matter of fact, right where your detail shows) She had mapped the area as Qg “Gravel, sand and clay” Everyone else (Dibblee, Crane and Graymer as well) had called it Leona. (There were lots of Leona fragments all over the steep slopes, so that mapping appeared to be reasonable). The exploratory trenches found that there was indeed deep old colluvium with abundant fragments of Leona. Ever since that time I had renewed respect for her old mapping. I also like her mapping of melange areas- uncontaminated by the later ’60s plate tectonic jargon, she just mapped it as she saw it- no fancy labels, like you see these days ! Dorothy is still around at age 92, in New Mexico. During my time at the USGS she was Dorothy Radbruch-Hall.